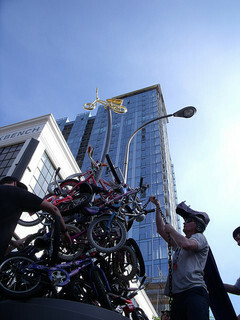 Portland has been the country’s bicycle capital for less than a decade. Claiming that crown took serious work — and retaining it will, too. Today, no major U.S. city is better at putting butts on bikes. With 6 percent of commute trips by bike as of 2010, it’s the bikingest metro area in the country by a wide margin — Portlanders are about 67 percent more likely to bike to work than Seattleites, our closest competitors. Portland’s bike culture is also so well supported in nearby cities that Oregon’s statewide bicycle commuting rate share is 2.1 percent — higher than in any other Green Lane Project focus city except San Francisco. Portland is also the only large U.S. city where biking to work is more popular than walking, a hint that bicycling has taken off in Portland despite fairly low average density. In 2000, the Census estimated that 1.8 percent of Portlanders commuted by bike — just behind San Francisco, Seattle and Minneapolis, and a bit further behind the national leader, Tucson. But as the animation below shows, Portland had just spent six years building a secret weapon: more than 100 miles of new bikeways. The results of this investment were delayed, but they came in a flood. In the next 10 years, Portland’s core bike-commuting population doubled, then tripled. By 2010, the city’s latest helmet-toting mayor had unveiled a soaring monument to Zoobomb (a silly, beloved local tradition that involves tiny bikes and large hills) and pushed through city government a 20-year, $613 million plan to build an American Amsterdam out of green lanes and residential greenways. The only problem: the city only budgeted $6 million for bike infrastructure in fiscal 2012. At that rate, it’d take 100 years to build its bike plan. Meanwhile, as the growth of Portland’s separated bikeway system slowed, other cities have been catching up. Between 2009 and 2011, according to the Alliance for Biking and Walking’s ranking of cities by miles of bike lanes and multi-use paths per square mile, Portland fell from sixth to fifteenth. Surpassing Portland in those two years: Long Beach, Albuquerque, Mesa, San Francisco, San Jose, Washington, Honolulu and Boston. Of the Green Lane Project’s six target cities, only Chicago and Memphis added fewer such bikeway miles in those two years. It’s not that Portland has been doing nothing. According to the same ABW report, it still leads the nation in innovative bicycle infrastructure such as bike boxes, bicycle traffic lights and colored bike lanes. And since 2009, Portland has been investing $2 million a year to build a network of neighborhood greenways — low-auto-traffic streets that backers say function as useful, popular high-traffic bikeways and cost far less in cash or political capital. But to bring its transportation system to the next level of bike-friendliness, Portland will be fighting one of its deepest legacies: It’s a city of profound cheapskates. Thrift has served the city well in the past. Portland’s entire 300-mile bicycle network only cost about $60 million to build between 1980 and 2008, Portland’s bicycle coordinator estimates. That’s about the price of a single mile of urban freeway. Just as important to the growth of bicycling: The city’s decision to not add a single mile of new urban freeway since 1983. Today, only three U.S. metro areas have fewer lane-miles of urban freeway or arterial street per resident than Portland’s, and only three drive on such streets less. This has saved many millions of tax dollars while encouraging the construction of a city that doesn’t require its residents to use a car for every trip. That city is still developing. But there’s broad consensus among the city’s bike believers, in and out of government, that Portland can no longer drive social change by simply not spending money. Portland’s history proves that infrastructure works. To remain the country’s bicycle capital, Portland will need to find money to build a new level of infrastructure: separated bikeways, cycletracks, buffered bike lanes. This is the task the Green Lane Project will be covering in Portland. I’ll be glad to be watching it with you. > Portland: What makes a great neighborhood greenway?